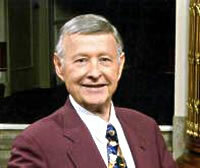 William C. (Bill) Boehm, Founding Director, started The Singing Angels in 1964 to promote the action and joy of singing good music, particularly amongst children. He earned a Master's Degree in Dramatic Arts from Western Reserve University. Bill was the first staging director of Cleveland Music Carnival Arena theatre, starring in Herman Pirchner's Alpine Village, and had more than 5,000 personal stage appearances. Other highlights of Bill's career included appearances as soloist with the Cleveland Symphony Pops Concerts; Singing Star of Chicago Theatre of the Air and tenor lead in the NBC-TV production of "Macbeth." In 1977, he was a awarded the prestigious Ohio State Governor's Award "for excellence of achievement benefiting mankind and improving the quality of life for all Ohioans." Bill was a Captain in the Infantry in World War II and was a past President of the Rotary Club of Cleveland. The William C. Boehm Endowment Fund to provide long-term funding so that future generations of young people can benefit from his vision. Mr. Boehm’s past contributions to, and leadership of, this community treasure have educated and trained another generation about what it takes to make a success of this very special group and to support the hundreds of young people each year who take part. He will always be remembered as the "Founding Director" of The Singing Angels, and will hold the status of "Director Emeritus" in honor of his great past achievements and contributions. His artistic mission is being carried out under the guidance of many alumni from throughout the decades, and his values and the lessons learned from him will continue to guide and teach all of those who are a part of this organization. That generation of alumni – passionate in their conviction as to the value of The Singing Angels as a community asset – has stepped up to accept the "passing of the baton" from Mr. Boehm in order to ensure that future generations of Greater Cleveland can continue to Make Music, Make Friends, and Make a Difference with Cleveland’s own The Singing Angels.